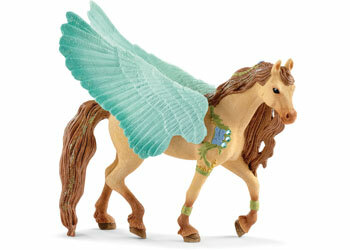 The Schleich figurines are exceptionally detailed, lovingly painted and allow children to play and learn at the same time. There are lots of magical creatures in bayala, but most of them are very shy and you can only catch a glimpse of them if you are very lucky. The most beautiful animals are arguably the flying horses and the unicorns. In a glade in the forest, not far from the elf town of Soleyas, lives very special family: A Pegasus, a unicorn mare and her young. When the magnificent Pegasus spreads his shimmering wings and soars into the sky, you can see what a majestic creature he is. Elves often stop by, comb his glistening mane and decorate him with flowers and he loves the attention. He now spends all day protecting his little foal and slowly teaching him how to fly. Would you like to fly with them?